One of the advantages of job hunting is that, after you've applied for as many jobs as possible, you have time to do other things. For me, that's mostly been sorting out all the junk in our flat - at the weekend I took two bags of clothes to the charity shop and sent a huge box of toiletries to Give and Make Up, and am halfway through putting my CDs on my laptop and watching various DVDs before selling them on - and experimenting with the contents of my make-up boxes (yes, that's boxes, plural). That has of course included working my way through my stash of nail polish, and in honour of the fact that the weather actually seems to be turning, by which I mean it's warm outside, I cracked out Ahoy!, one of China Glaze's summer polishes from a couple of years back. 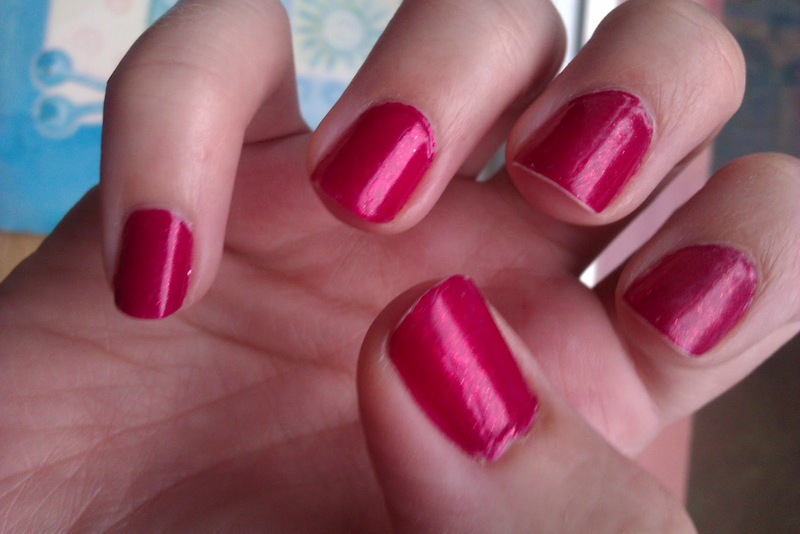 As you can see from the photo it's a raspberry pink polish with a slight golden shimmer. This is with three coats, plus Nails Inc base coat and Seche Vite top coat. One of the main things I like about this polish, as I do with most China Glaze polishes and particuarly their slightly darker ones, is that it has really good coverage. As mentioned above this is three coats but I genuinely think I could have got away with one. It also applied really nicely and had a particularly nice brush - not as good as Essie's admittedly but still pretty decent. Plus unlike the similar Barry M Raspberry it doesn't mark papers, as well as having more depth. However its main issue it that it chipped really quickly. I did this on Saturday morning and took the photo on Monday morning - it's now Tuesday and already at least five fingers have varying degrees of chips on them. To be fair I suspect this is partly due to my Seche Vite. I am fully aware that the cheese stands alone on this but I just do not like it. I don't feel it dries that quickly in comparison to other polishes and the shrinkage annoys me, so I'm giving up on it. I am currently on a 'no unncessary spending' month but as soon as it gets to July I'm throwing it away and buying a new one - have heard good things about Essie and Sally Hansen so will check those two out. Anyway, back to Ahoy!. I think it's a great polish - applies really nicely, great coverage and feels particularly appropriate to the current weather by being summery enough to add a bit of colour to the drab days. It'd make a particularly fab colour for toes on holiday teamed with a nice pair of sandals as it's one of those shades that would go with lots of stuff but still has enough impact. You can get Ahoy! from BeautyBay.com where it's currently on sale at £5.56 for a 14ml bottle.